Is globalisation good for the health of populations? Any such question demanding a response of limited scale must be caveated as an inquiry that cannot be determined definitively nor conclusively. Moving away from the universalities invited by the terminology of this question, we turn instead to a recognition that globalisation is a process occupying an historical trajectory in which this discussion must also position itself. Globalisation as a concept and word is the creation of a post-modernist age; one in which the ‘-isation’ suffix captures this sense of process. Fundamentally, globalisation is not static. Nor is it necessarily easily recognisable or identifiable at any period point. Rather, it is a steady process of assimilation and absorption akin to the commonly cited parable of the frog who leaps into then immediately out of a pot of boiling water, but which reaches a hot and messy death when it finds itself in cold water that is then heated. The nature and matter of globalisation has been the prompt of much academic discourse over the past quarter century since it was identified as a worldwide trend that is contested and characterised through cultural, ecological, economic and political dimensions. As Allen and Skelton (2010) have noted, since the mid 1980s people have become ‘fascinated by their interconnectedness variously considered through matters like the radical changes in financial transactions […while] other scholars have viewed globalisation as a more pervasive phenomenon which is transforming, or may be about to transform, virtually everything’ (Allen and Skelton, 2010, p.1). Globalisation is the flow of commodities, currency, health provision, technology and systems of belief. It is simultaneously a process and a condition. With such a macrocosm of effect and possibility, this consideration will map globalisation’s documented benefits and disadvantages to the health of the world’s citizens, before narrowing to a consideration of identity. Inextricably bound up in an anthropocentric sense of self harkening back to Descartes’s concept of ‘cogito ergo sum’ (Voss, 1993), is a psychobiosocial construct, which at both individual and collective population levels is subject to erosion due to globalisation’s potential to alienate, marginalise and mutate. The attention paid to mental health conditions has emerged almost simultaneously to globalisation, and affords an interesting parallel in this discussion. Globalisation has now distanced itself from early associations with a neo-colonial concept of Westernisation (Steger, 2009), and is increasingly seen holistically as a process that may benefit the health of a significant proportion of the world’s population through monetary re-distribution and sharing of medical services, techniques and professionals. However, the UN Secretary-General Ban Ki-moon’s adage associated with the Sustainable Development Goals (SDGs), of ‘leave no one behind’ (Anderson, 2015) indicates that populations have been – and could continue to be – excluded from these processes. Globalisation’s impact on health can be traced along two frequently converging trends: on the one hand, since the Renaissance and its precursors through Industrialisation (Steger, 2009) it brings a rapid dissemination of new health conditions and sees the re-emergence of previously contained diseases such as tuberculosis or Ebola. On the other, improvements in biomedical technology prioritise preventative medicine evidenced by the current focus of the Global Vaccine Alliance which is stockpiling Ebola vaccines as a preemptive measure for a relapse (GAVI, 2015). Comparably, globalisation seeks to absorb every nation state within an overarching economy whose very sustainability is questionable in the absence of a worldwide system of governance. Notwithstanding the World Health Organization’s (WHO) apparent global guidance on health provision in the current and future ages, countries and their governments are not answerable in practicable ways and WHO’s methodology is open to critique as Richard Howe commented in a recent interview published on MattersduMonde: ‘The problem: the nature of WHO leadership. Bureaucrats, medical doctors and academics take the lead in an operational matter […] treating the symptoms while ignoring the problem’ (2015). The result is a collection of national silos attempting to out-compete the global economy often with damaging effects on health in terms of job loss, reduction in self-esteem and associated physical health deterioration. One might consider such victims of globalisation to be those of the developing world, the disabled, those who cannot triumph in Charles Darwin’s ‘survival of the fittest’ system (Francis, 2016). But, as Allen and Skelton note, ‘marginalisation is not simply a matter of being on the fringes of the global economy. It includes those at the heart of the system too’ (Allen and Skelton, 2010, p.72). Globalisation seeks to introduce an Orwellian ‘1984’ style surveillance of peoples and habits, but, inadvertently, hiding places are created through time. As people change identities, cross boundaries, seek refuge or are forcibly subject to witness protection schemes, the traditional sense of citizenship is lost as populations are increasingly definable by mental health conditions, at times linguistically becoming the only labels to be certain of. make the crossing when the Gulf heals over (Armitage, 1992). Framed within a dinner party setting, the activity of lecturing conveys a sense of exchange of cultural ideas, contextualised within a geographical locus subject to transitions in capital, climate and personnel. The lexicon of ‘heals’ prioritises a globalisation that affects the individual, the local and the ability to be damaged and restored through change. Migrations of both peoples and aspects of their population has seen writers such as Steger pronounce the rise of ‘a borderless world [in which] hyperglobalizers [sic] seek to convince the public that globalization inevitably involves the decline of bounded territory as a meaningful concept for understanding political and social change’ (Steger, 2009, p.63). In this view, the ‘crossing’ of Armitage’s poem is a transition from the current standpoint to a place of financial and personal improvement enacted both through the physical performance of spatial transition and documentation. This imperative is not new. F. Scott Fitzgerald’s ‘The Great Gatsby’ (TGG) struggled to quantify the abstraction of the so-called ‘American Dream’. This novel sets itself up to be about money. Indeed, ‘money’ (that is to say the medium of exchange which defines the economic stock of a nation, in this case, the US) is the explosive trigger of the narrative – Nick Carraway moves to New York with the view to learn about the bond business. But like a gun, once the trigger has been pulled, the ensuing movement of bullet through time and space into an ultimate site of rest points to an inescapable demise or corpse. Fitzgerald’s personal and fictional experience of modern America was as a nation that promised unlimited possibility and immortality; an almost fantastical offering which people could literally buy into through activities on Wall Street, or by emigrating and identifying themselves as one of the denizens of the Americas. What TGG’s superficial story of love and loss parallels is how the American dream and money are interconnected and that the commodification and marketplace of that dream could be destroyed with or without record. The larger meaning of TGG lies within the failure of a nation to deliver on its promise of globalisation or, perhaps, of its citizens to create and fulfill the possibilities offered. Notwithstanding the uncertainty regarding why Paul Ambrose has been unsuccessful in acquiring a new ID or whether he identifies as mentally disturbed, the coincidence of this event twenty years ago with his assumption that he does not exist is fascinating. Globalisation seeks to homogenise and diminish cultural plurality, yet it still demands classification and personal registration to identify as a citizen. Identity is a critical part of being a participant on the global stage, and not be forgotten within it. The account of transactional choice between New York and California, triggered by the decease of Martin Luther, a figure of difference yet seeking to be part of an equal future world, is evidence that every person, whether mentally cognescent of being so, is involved in globalisation, figuratively buying their way into and out of it. Psychologically it is, of course, important to acknowledge that mental disorders are related to a ‘quality of social environment […making it] difficult to predict the impact of globalisation on the prevalence and course of psychiatric disorders. What is certain, however, is that mental disorders can no longer be dissociated from the global context that frames our lives’ (Bhugra and Mastrogianni, 2003, p.10). This all begs the question, ‘what is the sum impact of globalisation?’. As noted by Dollar in the Bulletin of the World Health Organization, ‘different sources of globalization [sic] have different impacts on inequality’ (Dollar, 2001, p.228). Inequality can present itself across fields of health, justice and individual freedoms. Globalisation is a process that is unlikely to be halted and that will continue until the resources and populations it employs and impacts reach an optimal point of health but will, surely, lead to crisis. It will take the health of populations only so far along the path of Amartya Sen’s development as freedom, as ‘the threat to native cultures in the globalizing [sic] world of today is, to a considerable extent, inescapable. The one solution that is not available is that of stopping globalization […] since the forces of economic exchange and division of labor are hard to resist in a competitive world’(Sen, 1999, p.240). This competitive world will win some health battles and lose others, with the alarming possibility of seeing populations ‘massing along the shoreline’ between liminal states of mental health and illness, physical firmity and deterioration, cultural history and dislocation. ALLEN, T. and SKELTON, T. (eds.) (1999) Culture and Global Change. Abingdon: Routledge. ANDERSON, M. (2015) Ban Ki-moon: sustainable development goals ‘leave no one behind’. The Guardian. [Online] 3rd August. Available from: http://www.theguardian.com/global-development/2015/aug/03/ban-ki-moon-hails-sdgs-agreed-by-193-nations-as-leaving-no-one-behind. [Accessed: 9th November 2015]. ARMITAGE, S. (1992) Kid. London: Faber and Faber. BHUGRA, A. and MASTROGIANNI, A. (2003) Globalisation and mental disorders: Overview with relation to depression. The British Journal of Psychiatry. [Online] 184 (1), p.10-20. Available from: http://bjp.rcpsych.org/content/184/1/10. [Accessed 11th November 2015]. DOLLAR, D. (2001) Is globalization good for your health? Bulletin of the World Health Organization. [Online] 79 (9). p.827-833. Available from: http://www.who.int/bulletin/archives/79(9)827.pdf. [Accessed 9th November 2015]. Figure 1. Paul Ambrose (2015) [Photograph]. Available from: http://www.humansofnewyork.com. [Accessed 1 November 2015]. FITZGERALD, F. (1998) The Great Gatsby. London: Penguin. FRANCIS, K. (2006) Charles Darwin and The Origin of Species. London: Greenwood Press. GAVI. (2015) Gavi to support rebuilding of immunisation programmes in Ebola-affected countries. [Online] Available from: http://www.gavi.org/Library/News/Statements/2015/Gavi-to-support-rebuilding-of-immunisation-programmes-in-Ebola-affected-countries/. [Accessed 10th November 2015]. HOWE, R. (2015) MdM Talks: Richard Howe on Malaria. [Online] Available from: https://mattersdumonde.com/category/mdm-talks/. [Accessed 6th November 2015]. ORWELL, G. (2013) Nineteen Eighty-Four. London: Penguin Books. STANTON, B. (2014) Brandon Stanton: The Man Behind Humans of New York. 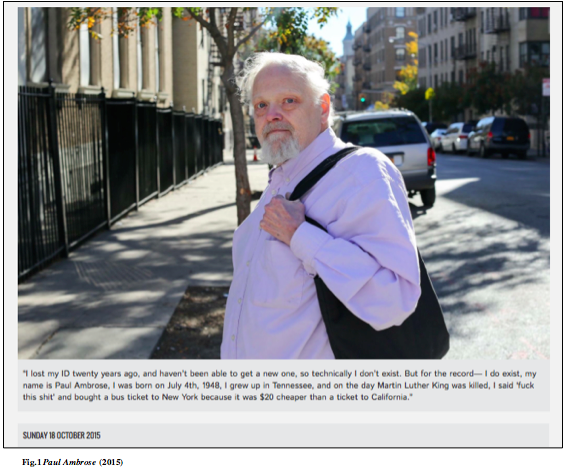 [Online] Available from: http://theculturetrip.com/north-america/usa/new-york/articles/brandon-stanton-the-man-behind-humans-of-new-york/. [Accessed 1 November 2015]. STEGER, M. B. (2009) Globalization: A Very Short Introduction. Oxford: Oxford University Press. VOSS, S. (1993) Essays on the philosophy and science of René Descartes. Oxford: Oxford University Press. Image Credit: The gaze of Dr. T. J. Eckleburg, The Great Gatsby. Ciaran Roarty, Flickr.